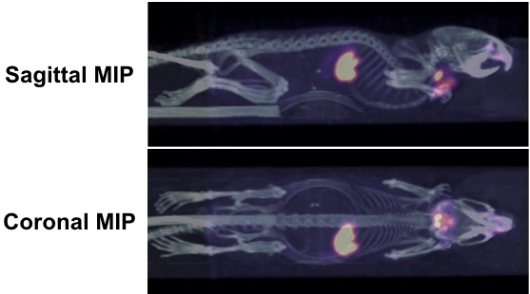 Targeted radionuclide therapy using α-emitting radiopharmaceuticals, such as 211At, has opened new possibilities for treatment of advanced and aggressive cancers. 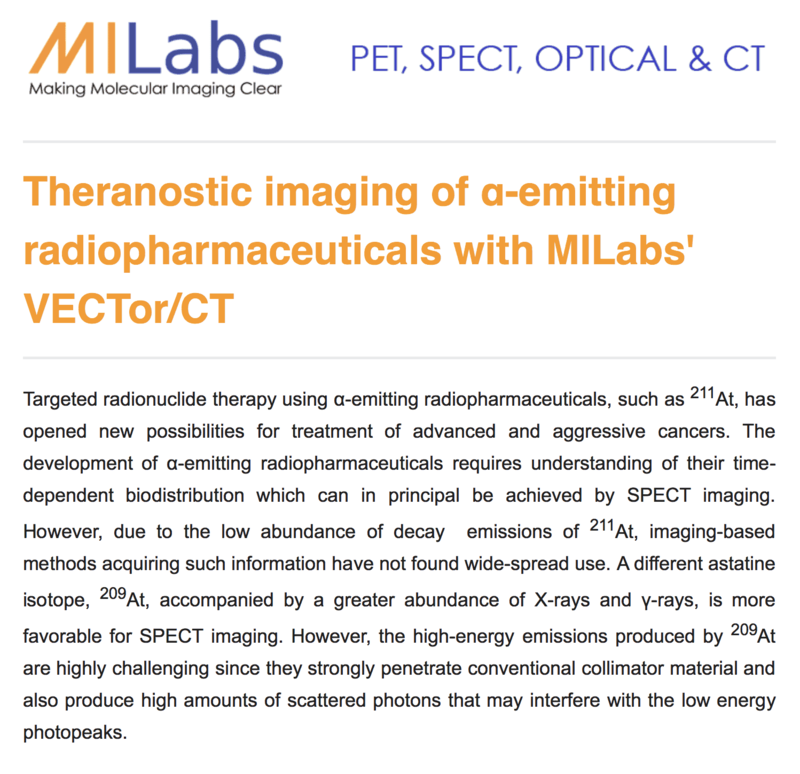 The development of α-emitting radiopharmaceuticals requires understanding of their time-dependent biodistribution which can in principal be achieved by SPECT imaging. However, due to the low abundance of decay emissions of 211At, imaging-based methods acquiring such information have not found wide-spread use. A different astatine isotope, 209At, accompanied by a greater abundance of X-rays and γ-rays, is more favorable for SPECT imaging. However, the high-energy emissions produced by 209At are highly challenging since they strongly penetrate conventional collimator material and also produce high amounts of scattered photons that may interfere with the low energy photopeaks. A recently published study in Physics of Medicine and Biology by Crawford et al. from the University of British Columbia, used the MILabs’ proprietary high-energy cluster collimation technology for quantitative imaging of 209At. Their aim was to accurately determine Astatine biodistributions with high spatial and temporal resolution. In addition to the high fidelity phantom scans, the in vivo SPECT data was in good agreement with the complementary ex vivo biodistribution studies. This study demonstrates the quantitative strength and superior resolution of VECTor/CT for such novel high-energy isotopes. Evaluation of 209At as a theranostic isotope for 211At-radiopharmaceutical development using high-energy SPECT. Figure 1: Sagittal and coronal maximum intensity projections of SPECT/CT demonstrating the biodistribution of 209At in a healthy mouse. The VECTor/CT has been used successfully to clearly image α- and β-emitting radiopharmaceuticals, and is unique with respect to this type of imaging. The high-energy collimation capabilities of the system provided the first-ever high spatial and temporal resolution of 209At SPECT images. The current study illustrated the potential of visualizing astatine biodistributions leading to novel theranostic applications. The unique high-energy collimation ability of the VECTor/CT modality makes it now possible to image a wide range of radioisotopes with ‘difficult’ high energies (such as 209At, 131I, and 213Bi, and 188Re [5,6]) with both ultra-high resolution and high quantitation accuracy and offering promises for developing new radionuclide therapies. 1. Crawford JR, et al. Evaluation of 209At as a theranostic isotope for 211At-radiopharmaceutical development using high-energy SPECT. Phys. Med. Biol. 2018. 2. Goorden MC, et al. VECTor: a preclinical imaging system for simultaneous submillimeter SPECT and PET. JNM, 2013. 3. van der Have F, et al. High-resolution clustered pinhole (131)Iodine SPECT imaging in mice. Nucl. Med. biol., 2016. 4. de Swart J, et al. Utilizing High-Energy γ-Photons for High-Resolution 213Bi SPECT in Mice. JNM, 2016. 5. Esquinas PL, et al. 188Re image performance assessment using small animal multi-pinhole SPECT/PET/CT system. Physica Medica, 2017. 6. ter Heine R, et al. Bench to bedside development of GMP grade Rhenium-188-HEDP, radiopharmaceutical for targeted treatment of painful bonemetastases. International Journal of Pharmaceutics, 2014.